Rev Series 1 DVD Review. It's just a good fun show that is enjoyable enough when it's on, and easily forgotten when it's not. It would make for a cold night with a cuppa and some chocolate. Like I said, an enjoyable distraction. This series is yet another good addition to the British comedy genre. It is about the day to day runnings of a parish, and the odd congregation that supports it. 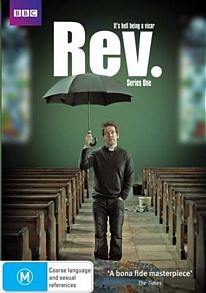 The rev in the series is the Reverend "just call me Adam" Smallbone. He's finally made it from the small country scene to the big smoke in London and is learning, fast mind you that life in the city is not at all as it seems. As he deals with life day to day he learns that being in the city is a whole different ball game. Like most British comedies, this is written with a very dry sense of humour, so if you don't like that sort of thing then this won't appeal to you at all. There are very little effects or instances of camera wizardry, it is simply the story that carries everything along. There are a whole host of oddball characters that propel this along nicely. Take for example the parishioner who orgasms during sermons, the local drunk who is a big fan of the church and the new Mr. Vicarage. Adam himself and his wife are almost the only "normal" members of the cast whose reactions to those around them make the show the amusing distraction that it is. That is how I would sum up Rev; an amusing distraction. I enjoyed it but I would never sum it up as a classic, nor even as a show I would care too much about. If it was on TV and I missed a show it wouldn't be the end of the world. It's just a good fun show that is enjoyable enough when it's on, and easily forgotten when it's not. It would make for a cold night with a cuppa and some chocolate. Like I said, an enjoyable distraction.